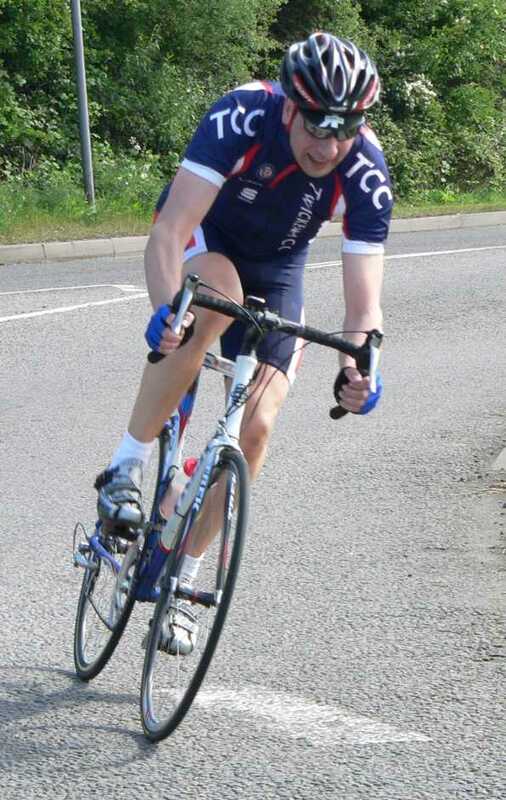 Tom Bell powered his way to victory on Saturday, ably supported by Tom Sutherland, Stuart Stow, and Alistair Barr. "I met Tom S and Stuart Stow at 6.45am on a cold and damp Saturday morning to drive out to the Thruxton motor circuit for round 8 of the Upavon Winter Series. There was a faint glimmer of hope as we neared the circuit and broke free of a dense mass of storm clouds and were under blue sky, but this didn't last for long! At the circuit, we met up with fellow TCC member Alistair Barr, who was looking forward to his first race, and were greeted with some 'pumping tunes' at the signing-on trailer, where we were informed that this week was much more popular than usual and that normally in the E123 there are only 17-odd riders competing for points down to 15th place...?! In the interests of keeping us all together we entered the 3/4, which in the end had around 50 riders starting. By this time it was absolutely hammering it down with rain, so we hid in Stuart's car instead of warming up! Eventually we came out of hiding and lined up for the start, and we were off. I think we were all surprised at how fast the race started, with the bunch strung out pretty much to single file before the first corner! Two Inverse/Bike food guys were at the front, with a small gap, with Stuart chasing. 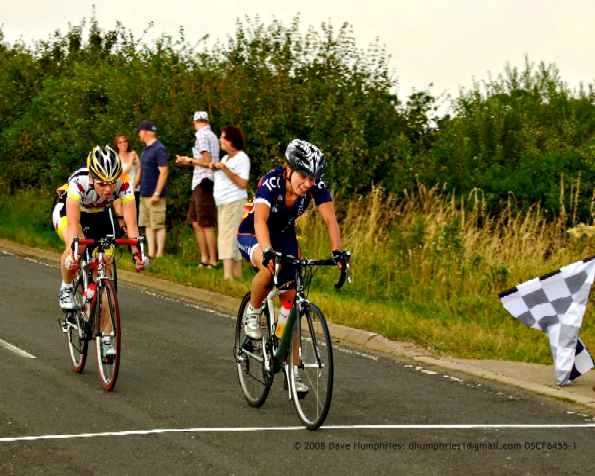 I came past Stuart with the aim of closing the two guys down, but when I looked back the three of us were clear of the bunch - all of 20 seconds into the race! We worked reasonably well together and stayed away for the rest of the 2 mile lap, but were being closed down and sat up and rejoined the bunch just as we reached the same first corner where we got away. As we were soft-pedaling back into the bunch, one of the Inverse/Bikefood guys said 'same again later?' to me, and I agreed. Drifting back down the side of the bunch, I was surprised to see the numbers had thinned out already, and I couldn't see any TCC guys. I eventually picked out Tom S and learnt that Alistair and Stuart had already fallen foul of the fast pace from the start. I expect the lack of warm-up was the main reason for this, as it was a very cold and wet and I also found it very hard to get the legs going. We were now about 10 minutes into the 1hr + 3 laps, and I really wasn't enjoying sitting in the bunch with very low visibility and getting oily gritty water forced down my throat and in my eyes! I worked my way back towards the front where a group of 7 or 8 had a small gap of around 5-10m over the rest of the bunch, and bridged across. As I came past this lead group I noticed the same Inverse/ Bikefood guy from before was near the front, and yelled something like 'let's go then' as I came past him. I looked back expecting perhaps 4 or 5 of us to have broken free but was surprised to see that the two of us were alone with a reasonable gap forming from the bunch. The two of us worked very well together for the next 45 or so minutes, maintaining quite a large gap over the bunch. I later learned that the rest of the Inverse/Bikefood team had done an ace job of keeping a pace in the bunch that was fast enough to discourage additional attacks yet slow enough to not chase us down! With about 4 laps to go, my breakaway partner was starting to struggle, so I instructed him to sit on my wheel for a bit and recover as I was concerned the bunch would inevitably increase in speed when we reached the 3-to-go and I would need his help later if we were to stay away. After half a lap we were working together again, and had upped our pace with 3 laps to go as we knew we had to give it an all- or-nothing effort as the bunch would likely be ramping up the pace behind us. Just after entering the penultimate lap, my break partner could no longer get on my wheel and I soloed the next lap and a half to my first win! The Inverse/Bikefood guy who I had been working well with for the majority of the race came in a well-deserved second, with the bunch coming in just behind. You'll have to ask Tom S for a report of the race in the bunch, but I believe we stayed away due to his and Inverse/ Bikefood's efforts to control the bunch, and (unfortunately) due to a crash that disrupted the chase in those last 3 laps. 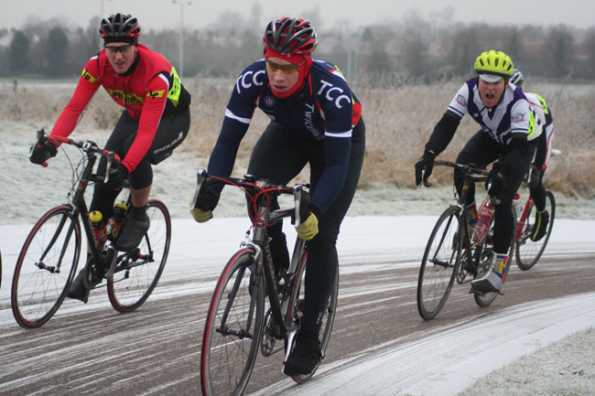 I had noticed Alistair continuing to ride around the circuit after he had lost contact with the bunch, and I hope this race hasn't discouraged him from future races as he would have had no problem in the 4ths at Hillingdon, and was a victim of a fast start in nasty weather! From the 50 or so that started, only about 25 finished the race. 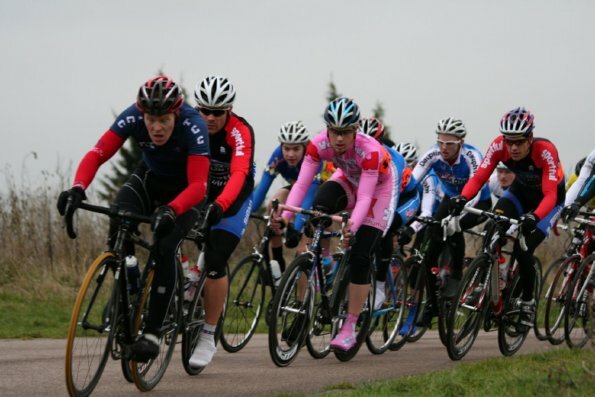 Also this weekend, Matt has been racing in Belgium, and I look forward to seeing his report." A Great Win for Tom ! Matt Myers represented the BC South-East on Sunday in Belgium, and delivered a gutsy performance, but sadly to no avail. "Absolutely horrendous weather greeted the 163 strong field in the little town of Kuurne in Belgium. Having spent yesterday traveling and in the hostel it was a real shock to the system to be outside in the wind rain and fierce crosswinds. We had all signed on on the professional looking sign-on board (i really need to work on my signature) in our South East Team jerseys. In actual fact only 1 of the five of us actually lived in the south east (Watford, birmingham, Kidderminster being the exceptions) yet we all bonded as a team pretty well and all looked relatively attentive at the front on the pack at the start in Kuurne. As to the race itself we started at the front of the field but as soon as the race started in the neutralised section it all kicked off, pushing shoving, cycling on the pavements, and crashes (yes in the neutralized section!) adding to the already edgy atmosphere. I managed to settle down in about mid pack and spin along, although the pace was brutal from the start the pack was together. Funny to note was the World junior champion in his rainbow jersey swanning around the peleton getting envious looks and abuse from most of the competitors! About 80km into the 125km race just before the cobbled section (and in the most hectic pace of the race yet) i feel the road bumping under my back wheel, "Oh my god nooooooo not now please not now" i thought, but it was not to be. A puncture at the most crucial part of the race. I got my spare wheel in double quick time and started the most horrible chase back on in my life, weaving through the team cars with bikes on the roofs and the commissars car. I got to about 30m to the back of the pack then the dreaded first cobbled section kicked in and the pack immediately split with me of the back in a small groupeto. I carried on none the less with a strange feeling of duty that i had to finish but then subsequently my group after being literally blown of the road in the crosswinds (the worst some had ever seen) having endured the cold, wet and grimy back wheel spray and i was subsequently swept up in the the dreaded broom wagon at the back of the race. Lucky for me i found a friendly face in the jam packed van full of Belgians, dutch, French all either crying singing or laughing (very surreal i know!) and i sat down next to euan who had crashed out after 30km after "a bloody Norweigan took me out" i didn't know there were any Norweigans in the race but i went along with the story none the less. We arrived back at the start again to bus loads of freezing cyclists freezing in the rain waiting for their bikes to be taken out the wagon, we decide to go into the cafe to warm up and dry off. We waited an hour by which time we hear that only 21 riders of 163 actually finished the race with only one of our five riders finishing and he had hypothermia! So i didnt feel as gutted when i realized what had happened and took to changing in the same changing room as liquigas (yet another surreal moment) and trying to help Connor who was our only finisher. We all discussed our horror story of our race with each other in the car home and subsequently fell asleep. So after my descent into the most hellish afternoon of many of our lives, i had emerged with a puncture, sore legs, a DNF and most importantly a life changing experience (maybe a little exagerated!) and a hunger to go back and do it again." This years Rollapaluza Winter league signed off with a bang last Wednesday, with Darren Paice once again riding consistently to reach the Quarter-Finals, but unfortunately no further, and Stuart Stow not progressing from the heats despite recording a 47.2mph average! The main focus however, from a Twickenham perspective, was in the Ladies Competition, where both Dorchie Cockerall, and Wiesia Kuczaj have been phenomenal this year. For the second time, V took third place on the night, succumbing to Estelle Rogers, but Dorchie made a Clean Sweep of the series recording her fourth consecutive victory, and posting a new Womens Record of 24:08 to boot. Subject to confirmation, V finished the series in =2nd place!!!! 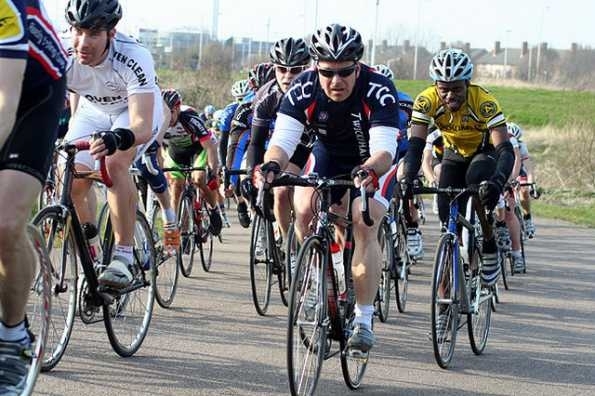 A report can be viewed on the Rollapaluza website. 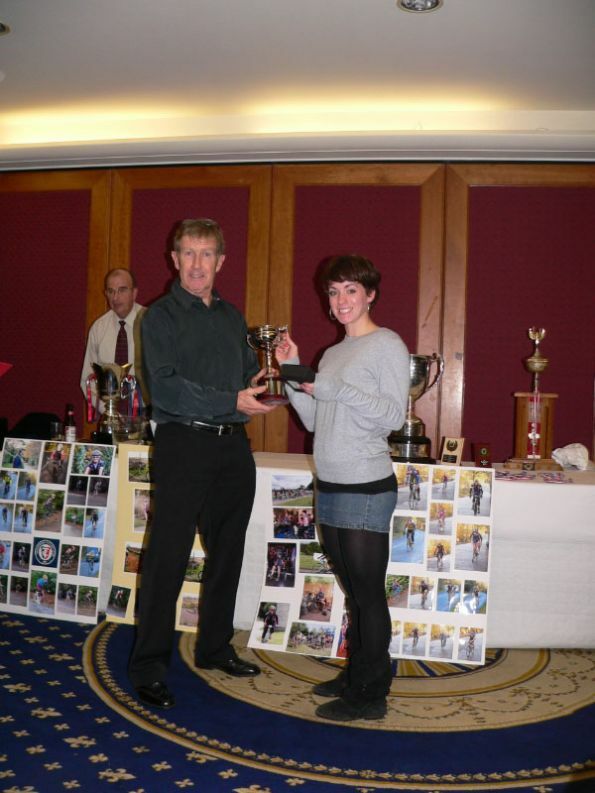 This year's Surrey Rumble takes place THIS SUNDAY 7th March.